Today isn't just another day off, it's a day to remember those who have sacrificed their life for your FREEDOM. 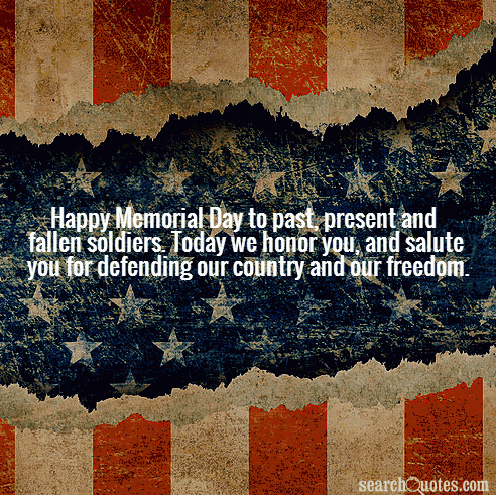 Happy Memorial Day! Happy Memorial Day to those who sacrificed their life defending our country and our freedom. May you remembered and honored for eternity. A soldier that dies to protect the lives and freedom of their fellow citizens deserves a day of recognition. Happy Memorial Day. Happy Memorial day to our fallen soldiers. May their bravery, and heroism be remembered and honored forever. Happy Memorial Day to past, present and fallen soldiers. Today we honor you and salute you for defending our country and our freedom. God bless all of the brave men and women who have fought & who are still flighting to keep our nation free & safe! Happy Memorial Day. As we enjoy this memorial day weekend let us never forget those who have served and those serving who give us the privilege of freedom. Memorial Day is the respect that is shown for the martyrs or brave men who have laid their lives for the sake of their country. It is a great sacrifice to lay down the life for a great cause and as Minot savage said, “the brave never die, though they sleep in dust. Their courage nerves a thousand living men”. The sacrifice of these brave men is a great source of inspiration and guidance for thousands of others. “On thy grave the rain shall from the eyes of a mighty nation “are the words of Thomas William parsons. If not for the brave soldiers, the frontiers of a country would be in constant peril and the other citizens cannot live in peace and happiness. 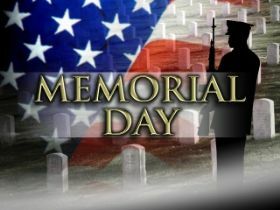 Hence the Memorial Day should not be mourned but must be saluted for their sacrifice and honor that they have undergone. Read these quotes on Memorial Day and get inspired.